Back in late 2011, I had the unique distinction of custom designing a very special awareness bracelet. Holly had contacted me because one of the most important people in her life was battling stage 4 lung cancer. This person, Susie, was not her biological mom but was like her mom, for 24 years. In Holly's words, "She (Susie) has three sons but the bond a mother and daughter have is unbreakable. I have been searching and searching for a piece of jewelry that blew me off my feet and when I saw your awareness bracelets, I knew I had found the one." Susie had just finished chemotherapy and Holly wanted to honor her with a beautiful custom beaded bracelet. She had fallen in love with my Original and Exclusive Live Life Give Life Awareness Bracelet (B113) and that became our starting point to design the most amazing meaningful custom beaded bracelet possible. Holly wanted to incorporate somehow the special meaning of family, her love for Susie and raise awareness of lung cancer. While sitting in my living room one night, I noticed a decorative sign I had on the shelf that read 'cherish family' and it was then that I knew I had to somehow incorporate the word 'cherish'. The challenge was to take an existing design using four sets of four-letter words and convert that to two sets of four-letter words and one seven-letter word. After hours & days of manipulation, incorporating the sapphire Swarovski Crystal (which is Susie's birthstone) with Swarovski Pearls, the design came together...just like it was meant to be. Let me share another "everything happens for a reason" story. Holly was having this bracelet designed as a surprise for Susie. One night, she happened to talk to Susie and asked Susie what she thought she should get as a gift for her mom. Susie suggested a bracelet with beads and words because she thought they were so beautiful and meaningful. Little did Susie know that is exactly what Holly was having designed for her. It was then she knew without doubt, this was the. perfect. gift! 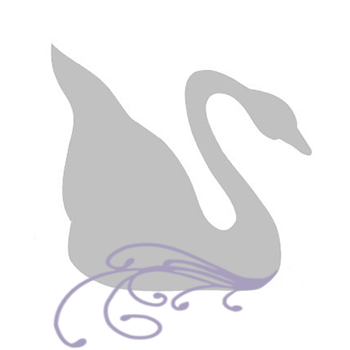 When Holly and I spoke on the phone she told me she chose Crystal Allure Jewelry because, as she said, our jewelry is 'amazingly beautiful and she was deeply touched by the level of personalization we put into our custom designs.' It was my honor to have been chosen to create this custom design for two very special people and to have been touched by their beauty. 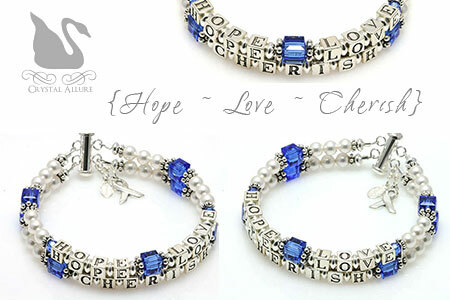 Holly's Custom Hope Love Cherish Mothers Bracelet (B204) was designed with sapphire Swarovski Crystals, sterling silver beads, Swarovski Pearls, Bali and sterling letter blocks. Finished with a sterling silver awareness ribbon charm and our signature jewelry tag. Our beautiful 2-strand cuff style handmade beaded awareness bracelet represents lung cancer (Hope & Pearls); the sets of Swarovski Pearls in 3's represent Susie's three children: Brian, Joe and Danny (Love); Susie is like family to Holly and each hold a special place in their hearts for each other (Cherish). I LOVE IT!!!!!!!!!!!!!!!!!!!!!!!!!!!!!!!!!!!!!!!!!!!!!!! Love it!!!!!!!!!!!!!!!!!!!!!!!!!!!!!! After a not-so-great day this bracelet brought such a big smile to my face and heart.